2017 general elections were held in Ecuador on 19 February 2017 alongside a referendum on tax havens. Voters elected a new President and National Assembly. Incumbent President Rafael Correa of the PAIS Alliance was not eligible for re-election, having served two terms. 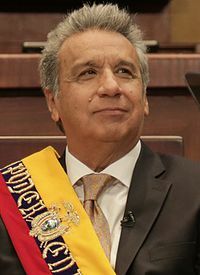 In the first round of the presidential elections, PAIS Alliance candidate Lenín Moreno received 39% of the vote. Although he was more than 10% ahead of his nearest rival, Guillermo Lasso of the Creating Opportunities party, Moreno was just short of the 40% threshold required to avoid a run-off. As a result a second round was held on 2 April. In the second round Moreno was elected President with 51.16% of the vote. This page was last changed on 16 September 2018, at 06:24.